Everybody wants to be a successful blogger, and somehow, everybody has a blog. Digital has never been so present in our daily lives and technology allows anyone to build professional websites, almost for free. Some industries triggers more interest from bloggers than others. The luxury industry is one of them. Fashion, beauty products, premium travel or luxury design are some of the topics that saw the rise of a new type of media, the Luxury blogs. Some of them became very popular worldwide and others went from the status of completely unknown to superstars. Here is a top 3 best blogs on the following segments based on the knowledge they produce, the impact they have as influencers and the interest of their profile. 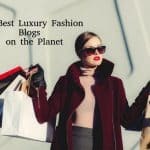 Top 3 Fashion blogs, on the spot! Fashion bloggers have the skills to feel what is hot and what is not. By spending so much time talking about fashion, some of them became true experts and end up defining the incoming trends, brands and outfits to follow. A few even launch their own fashion lines and become true references in the fashion industry. After the couturiers or the malletiers, maybe the next generation of fashion designers are bloggers? Maybe. Until we know this, here are a top 3 blogs about fashion, beautiful ladies with a lot of ideas in their beautiful minds. Swiss based-blogger, Kristina Bazan became a true phenomenon in her country. Her blog is so successful that most of the brands that she collaborates call it “a click-machine”. This is for sure to illustrate how much traffic her blog can drive to a brand’s website. With 1.4 million fans on Facebook, Kayture is a great influencer in the fashion industry. Being a model as well, she can travel the world and share her experiences and different outifits. Sandra Bauknecht, for Sandra’s Closet. There are women who like fashion and there are women who a profoundly in love with fashion. The fashion industry is a true passion for Sandra Bauknecht. Based in Zurich Switzerland, she writes about her love for fashion. She travels the world from fashion week to fashion week. She is also editor for fashion magazines and organizes events for several luxury brands. Chiara Ferragni, for The Blond Salad. The young italian blogger, she is one of the biggest fashion bloggers, at least in terms of reach. She has almost 4 million followers on Instagram. Everytime she posts a picture on her instagram account, she gets a minimum of 40k likes. Born in Italy, now she lives in Los Angeles where her exposure increased a lot. She is a worldwide player. When it comes to beauty bloggers, 2 main categories dominates the scene: make-up and nail-art. These two segments from the beauty industry became true online phenomenons. These 2 categories are also driving sales and sales growth in the entire industry, so any key influencer on make-up and nail-art is a person who potentially can mean a lot of money to brands. Fragrances are also a very interesting topic as only a few blogs know how to correctly talk about it. There is a need for a big amount of expertise in order to being able to refer to fragrances and other perfumes. Here are a top 3 blogs that you should know if you like beauty products. Based in Switzerland, Andreia is a very passionate person. She likes beauty products in general, from lipsticks to nail art. She has a very honest way to express her opinion about brands and products she tries. And trust me, she tries a lot! During the past 5 years, she accumulated a great knowledge about beauty products. I bet she knows better the prices of all lipsticks in a store than the sales person himself. It is a blog to follow (in french). The UK is a great market for luxury products and especially make-up. So it is natural that we present one of the biggest blogs about makeup: Pixiwoo. It all started with 2 sisters, Samantha and Nicola, and their youtube channel. Now with their 1.8 million subscribers they are true stars in the UK and beyond. Essentially they talk about make-up. From tutorials to product reviews, they are very creative. Some of their make up techniques are pretty amazing and their videos are quite minimalists, giving all the beauty to the make-up they are doing. Chantal Helene Wagner, for The Scented Salamander. She is probably the pioneer of Perfume blogs. Chantal Helene Wagner started her blog back in 1996. We use to say that was the year when beauty blogs started. With a Anthropology PhD in the pocket, Chantal adds an amazing historical aspect to most of her articles. Each one of them are true discoveries and you will always learn something new when you read them. Through the years she became a true expert on perfumes. Top 3 Lifestyle blogs info-holics all day long. Lifestyle is a very broad category. Basically everything related to consumer habits, purchases, destinations, brands, products and people can be ranked as lifestyle. So when you dare to have a blog related to lifestyle, you definitely have a lot to say (or to write). Generally these blogs have a very interesting angle about how they approach things. They are real references for all people looking for a general look in luxury. Here are a top 3 blogs you should definitely read and bookmark on your browser. Jorge Guerreiro, the “eye” behind JSBG. JSBG is very interesting website about a wide range of topics. It is a true lifestyle website with several clever contributors who publish great piece of content from fashion, to travel, brands, strategies, etc. everyday there is something new and they are pretty active on social networks. Rob Gautereaux and Kamran Razavi, Just Luxe. Editorial is power. JustLuxe is a luxury Web publication providing objective analysis and information to affluent consumers of luxury goods, services and travel. With more than 250 lifestyle articles every month, JustLuxe is a strong platform for all fans of beautiful things. With this edgy selection, you have a clear picture about today’s luxury blog landscape in the international level. These websites represent hours and hours of hard work to bring you the very best in terms of luxury news. There is a lot of qualitative content in these websites and a lot are very exclusive. And this is the true luxury. Info sourced on the respective websites. All content is copyrighted with no reproduction rights available. How to start a blog about luxury? Luxury News to Style You Up!